Open mapping tools help Jakarta plan for floods. 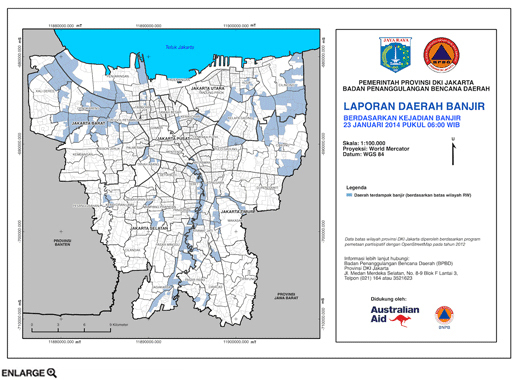 Aid organizations mapped rainfall data in Jakarta to track the spread of floods throughout the city between January 8 and 29, 2014. December to February is the peak of the rainy season in Indonesia—a time when severe flooding often hits its capital city, Jakarta, and its 10 million residents. In 2007’s floods, 340,000 city residents had to evacuate their homes, more than 70 people died, and more than 200,000 people suffered disease, according to the World Bank. The bank estimates the cost of those floods at $900 million, a combination of financial aid and economic losses. Bad floods in 2013 caused another 29 deaths and displaced more than 37,000 people. Jakarta’s disaster management agency wanted to improve the software models it used to help plan evacuations and aid efforts during the flooding, often a time of blocked roads and power outages. But the agency needed better information about where people lived and worked and where facilities such as roads, schools, hospitals, and fire stations were located. To make more detailed maps of the city, it connected with the Humanitarian OpenStreetMap Team (HOT), a charitable organization based in the United States that teaches communities how to edit an open map of the world. The system is free for anybody to use. In 2012, with the support of other relief organizations in Indonesia and the Australia-Indonesia Facility for Disaster Reduction (AIFDR), HOT began teaching local university students how to map their cities. During that flooding season, AIFDR made other maps using data from the workshops to track rainfall patterns. Teams from HOT then joined them during last year’s rainy season, mapping rainfall data provided every few hours from Jakarta’s 267 villages to create more than 150 maps illuminating the rainfall in each area. The data came in many forms—phone calls, texts, instant messages, and faxes—and took several hours to process. The HOT maps helped villages identify evacuation points and areas in need of help. They became a way for citizens to show on social media how they were affected by the floods, and they helped communicate the overall scope of the floods so residents could avoid hard-hit areas of the city. This December, HOT will deploy an Android application for recording rainfall, allowing for quicker analysis of the information. The team is also working on ways smaller divisions of the villages can report data.